Donnie Darko, one of the seminal turn-of-the-century films, had a hell of a soundtrack filled with a creepy score by Michael Andrews, an instant classic cover by Gary Jules, and numerous 80s pop and alternative rock hits. Too Good For Radio has found ten quality remixes of these songs for a Halloween treat to our beautiful readers. Some of these tracks appear on the director’s cut of the film, and if you haven’t seen that, you haven’t seen Donnie Darko. Tip of the hat to the following producers: Chang3up, Virgin Magnetic Material, Charles Cunningham, Emerson & Fox, Coldvet, Mick Collins-Gellar, Christian Strobe, Matt Fernandez, Phutureprimitive. 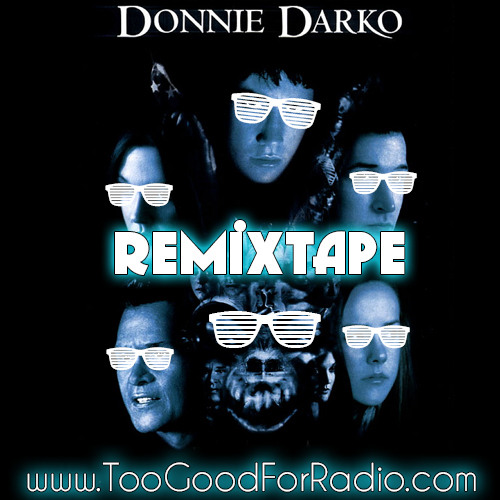 Download: Donnie Darko ReMixtape – HAPPY HALLOWEEN!! I love the things you post/do. Too Good For Radio Copyright © 2016. If any music file, photo, video, or other digital media work hosted on Too Good For Radio should be removed due to copyright infringement please contact us at inf[email protected] and we will remove it promptly. The music found here is for promoting artists and reviewing released music. Please visit your local record store and attend concerts and festivals!